Suddenly the stage is full of water and a rock. They stand waist high in cold water, holding hands, looking out. I love the simplicity of that direction, and that Ruhl didn't back away from her vision even though the actualization of it sounds untenable. She believed that the director, Les Waters, the scenic designer, Annie Smart, and the stage crew could bring her imagination to fruition. The resulting water scene in Dear Elizabeth, now playing at Berkeley Rep, doesn't match her directions exactly, but it does interpret it. I can't say more or I'll spoil the surprise. What I can tell you is that underneath the stage there are two 500-gallon water tanks and a sump pump to get the water up to the stage. It takes two people on headsets to run the tank. When stage manager Cynthia Cahill gives the cue, "Go water," one of the the crew flips the open switch on the first tank. When that primary tank gets low, the second crew member opens the valve of the "slave" tank. "The set-up is very Rube Goldberg," says stage supervisor Julie Englehorn. At intermission, the crew pushes the water off the stage to a downstage drain with long-handled squeegees. They follow up with towels. After each performance, Englehorn washes four loads of laundry. And what does the water mean? Literal-minded patrons want to know. In one poem, Bishop wrote, "There are too many waterfalls here; the crowded streams / hurry too rapidly down to the sea." So there's that. I asked a poet what she thought the water meant, and she said, "emotional possibilities." Another poet looked at me quizzically, "Does it have to mean something?" 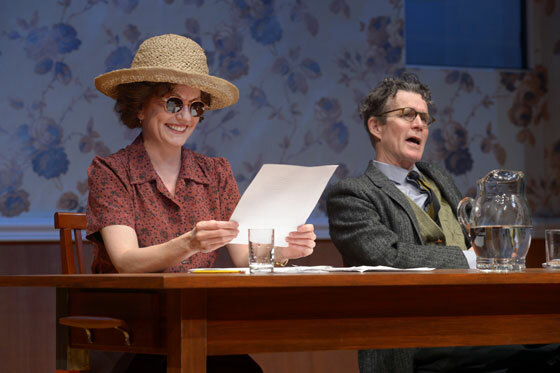 Come see the water, and this beautiful and tender play that Ruhl elegantly describes as, "a play in letters from Elizabeth Bishop to Robert Lowell and back again." The "House is Yours" is a specific term used by a front-of-house manager in handing over the audience to the stage manager. I'm a house manager at Berkeley Repertory Theatre, but please don't hold them responsible for anything in this post other than the fact that they employ me in their house built on words.